This week, we're talking with Andrew Rhodenbaugh. He's playing Hamlet in a production by The Great Work Begins Theatre Troupe. The group has been presenting Shakespeare at Camp Wokanda in Chillicothe since the summer of 2012, and has staged other productions at venues in and around Peoria. He talks about the genesis of the company, about the challenges of taking on an iconic role Shakespeare, and about taking theatre to unconventional locations. 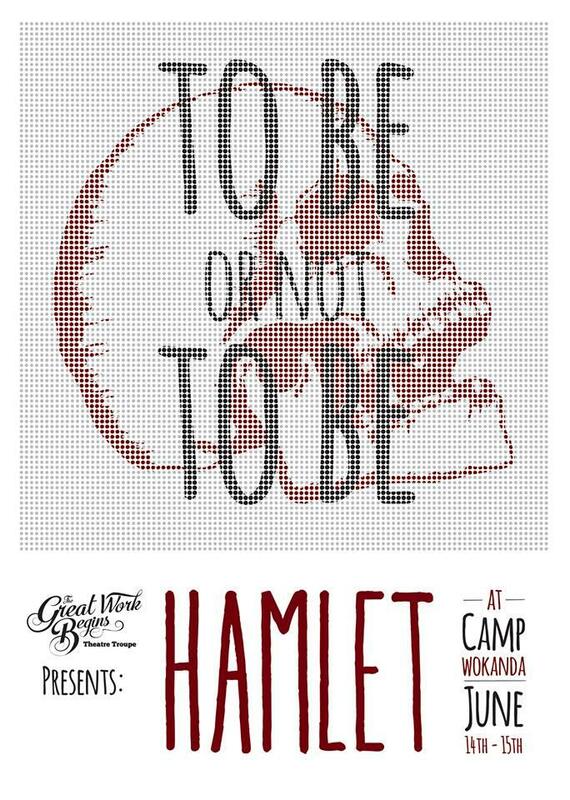 The Great Work begins performs "Hamlet," Saturday at 11:30 a.m., and Sunday at 11:30 a.m. and 3:00 p.m., at Camp Wokanda. This week, we're talking with Barry Cloyd. He and his band Celtricity are headlining the "Roots of Folk" concert, Saturday night at 7:30 at the GAR Hall in downtown Peoria. 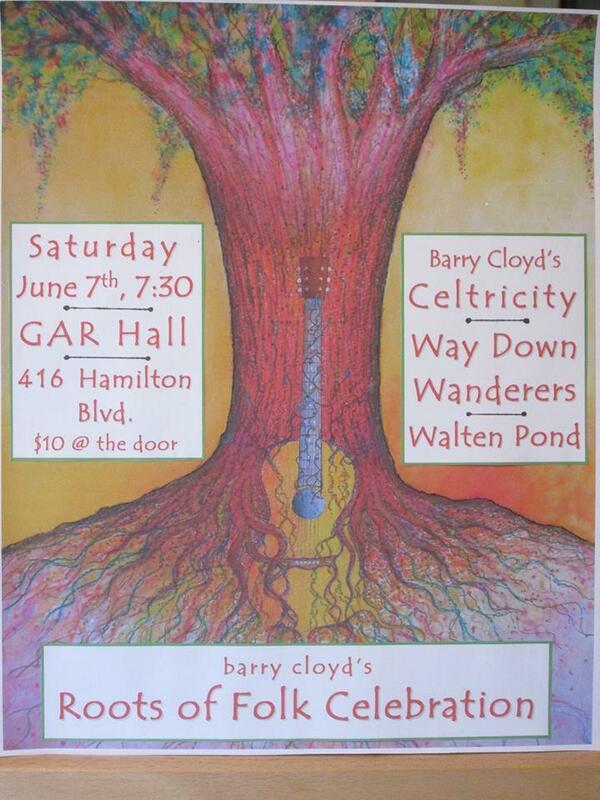 He talks about the two other bands on the program -- The Way Down Wanderers, and Walten Pond. He contrasts the generational approaches to folk music the three bands offer. And he updates us on some of his other musical projects. David Commanday, Artistic Director of the Heartland Festival Orchestra, talks about this weekend's upcoming concert. "Victorious Beethoven" pairs the composer's Fourth and Fifth Symphonies. Commanday contrasts the two symphonies, and talks about another piece on the program, which features the orchestra's principal instrumentalists. "Victorious Beethoven" will be performed Saturday night at 7:30 at Five Points Washington. This week we're talking with Peggy Beaux Hupp. She;s directing "Smokey Joe's Cafe" at Peoria Players Theatre. The show is a "jukebox" musical, built around the music of Mike Stoller and Jerry Lieber. We talk about some of the numbers featured in the show, about finding the right voices to make up the cast, and about the challenge of directing a musical with no story line and no recurring characaters. "Smokey Joe's Cafe" runs June 5th through 9th at Peoria Players. This week, we're talking with David Commanday, Artistic Director of the Heartland Festival Orchestra. They've added an additional concert to their 2013-14, featuring a return appearance by soprano Barbara Padilla. Padilla has performed with the HFO. For this concert, she'll be presenting material from her forthcoming CD. The concert is Saturday night at 7:30 at Five Points Washington. This week, we;re talking with Mary Rous, about the Arts in Education Spring Celebration. Now in its 29th year, the program spotlights the performing arts programs in local schools with performances and exhibits at the Peoria County Courthouse Plaza. The Spring Celebration continues weekdays from 11:00 a.m. to 1:30 p.m., through May 23rd. This week, we're talking with banjo virtuoso and multiple-Grammy-winner Bela Fleck. He's performing his composition "The Imposter," a concerto for banjo and orchestra, with the Peoria Symphony Orchestra in their concert on Saturday night. He talks about the piece itself, the story behind its composition, and his wide-ranging musical career and collaborations. We're talking with Josh Cox, Exhibitions Coordinator at the Peoria Guild, about two current exhibits: "Between the Void" by Mel Cook, and "Memorial" by Angela Inez Baldus. Cox says both artists bring novel approaches to traditional genres, such as portraits and landscapes. Cooks incorporates other media and thick brush strokes into her paintings; Baldus bases her portraits on people and stories she's drawn to. Both shows continue through April 30th. This week, we're talking with Sandy Fisher about "Beginnings" -- an exhibit of her work -- at Exhibit A Gallery, at Junction City Shopping Center in Peoria. Fisher talks about her choice of medium, her collaboration with gallery owner Barbara Milaccio, and about the inspiration behind some the works on display. The exhibit opens with a reception Friday night at 5:00 p.m.. It continues through April 28th. This week, we're talking with Alex Larson, director of Corn Stock Theatre's production of "Superior Donuts." He talks about why he chose the script, about the subjects the play addresses, and the actors he cast to play the two principal roles. "Superior Donuts" continues with performances Friday, Saturday and Sunday at the Corn Stock Winter Playhouse. This week, we're talking with Charles Killen, director of Peoria Players Theatre's upcoming production of "The Miracle Worker." He talks about his own history with the play, about casting the two principal roles, and about the subject matter of the show remains relevant in 2014. "The Miracle Worker" runs March 14th through 23rd at Peoria Players. Director sees humor and humanity in "Clybourne Park"
This week, we're talking with Egla Birmingham, director of Bradley University Theatre's production of "Clybourne Park." Set in the same house as "A Raisin in the Sun," the play offers a perspective on how race and family have changed over the past fifty years. Birmingham talks about what she finds appealing in the script, and about working with young actors to bring the text to life. "Clybourne Park" continues through Sunday, March 9th. Corn Stock production asks "What is art?" This week, we're talking with Cindy Hoey, Corn Stock Theatre Manager, about their production of "Art." The play tells the story of three friends, whose friendships are upended when one of them acquires a piece of modern art. She talks about the three actors who make up the cast, and about what the show has to say about both art and relationships. She also talks about an art exhibit Corn Stock is hosting in conjunction with the production. This week, we're talking with George Stelluto, about "Romance," tonights concert with the Peoria Symphony Orchestra. Stelluto talks about striking a balance between large, orchestral pieces on the program and smaller works performed by a jazz combo. He also talks about working with soloists Linden Christ and Ryan Lanning to select the music in the concert. And he talks about some of his own favorites -- from Nat "King" Cole and Billy Eckstine, among others. This week, we're talking with Chip Joyce, who plays Fagin in Peoria Players' upcoming production of the musical "Oliver!" Joyce says it's one of a handful of roles on his "bucket list." The role requires a fair amount of stage makeup, and adopting a specific voice and gait. "Oliver!" opens tonight, and runs through February 16th at Peoria Players Theatre. Nathan Irwin and Suzette Boulais talk with Roberta Koch about "Seasonings," a multi-media presentation at the Peoria Riverfront Museum. A group of actors will read from essays and columns by Jerry Klein, longtime columnist for the Peoria Journal-Star. The essays, which reflect on the changing seasons in Central Illinois, will be accompanied by local photographs by Joe Couri. "Seasonings" will be performed Sunday, February 9th at 2:00 p.m. in the Giant Screen Theatre. CAC exhibit features selections from "The Monkey Project"
This week, we're talking with Randy Witte about "The Monkey Project," a multi-year effort to collect drawings, paintings and sketches of monkeys. Participants have included celebrities like Betty White and Jack Black; artists and filmmakers; and notable Peoria residents. An exhibit at the Contemporary Art Center features 30 works drawn from his collection of more than 900. It runs through February 7th. This week, we're talking with Cindy Hoey, manager of Corn Stock Theatre. Their latest production, "A Piece of My Heart," recounts the stories of six women during the Vietnam War. Hoey talks about the cast director Amy Williams has assembled for the production, about the play's resonance at a time when more women are involved in and affected by wartime service, and about the theatre's desire to stage a production with multiple strong roles for women. "A Piece of My Heart" opens Friday night, and continues through January 26th. David Commanday, Artistic Director of the Heartland Festival Orchestra, talks about the orchestra's upcoming concert, "Vienna to Broadway," which traces the musical evolution from Viennese waltzes and light opera to the Broadway stage. The concert features a return performance from vocalist Doug LaBrecque, and newcomer Lisa Vroman. It begins Saturday night at 7:30 at Five Points Washington. Sam Gappmayer is the new President and CEO of the Peoria Riverfront Museum. He talks about his plans for the museum: He hopes to make it more "nimble," to pursue programming that reflects the region and be open to collaboration with partners across the community. He also talks about one of the Museum's current exhibits. This week, we're talking with Mark Grizzard, Music Director of the Peoria Area Civic Chorale. They're presenting their annual holiday concert, "An American Family Christmas," with performances Friday and Saturday at 7:30, and Sunday at 2:30, at Five Points Washington. This is Grizzard's first season with the Chorale, and he talks about bringing his own touch to the group's signature concert. Grizzard also contributed two original arrangements to the program. The Peoria Ballet presents its annual production of "The Nutcracker" this weekend, with three performances at the Peoria Civic Center Theatre. The Ballet's Tamra Challacombe explains what makes "The Nutcracker" a good introduction to the art form. She also talks about what a live orchestra adds to the experience, and about some of the guest artists featured in the production this year. Joseph Henry directs the Eureka College Chamber Singers in their 25th annual Christmas Renaissance Dinner this weekend. Henry talks about the program, and how it differs from other madrigal dinners in the region. The event features a new script written each year, and period music selected to tell the story of the Nativity. Performances begin at 6:00 Saturday and Sunday at the Cerf Center at Eureka College. This week, we're talking with John Jost, conductor of the Bradley Community Chorus. Their fall concert, with the Bradley Symphony Orchestra, presents settings of the "Te Deum." Jost talks about the celebratory nature of the text has inspired many composers to "pull out all the stops," and about how the chorus and orchestra practice separately for most of the rehearsal process. The concert will be presented Sunday at 4:00 p.m. at St. Mary's Cathedral in Peoria. This week, we're talking with Blake Stubbs, from Corn Stock Theatre. He's one of three directors in their upcoming production, "Relatively Speaking," a set of three one-act plays. He talks about the "act" he's directing, about collaborating with the other two directors and about what he's learned as a first-time director. "Relatively Speaking" runs next weekend, with performances Thursday through Sunday at the Winter Playhouse. The Peoria Symphony Orchestra presents its latest concert, "Allure of Paris," tomorrow night at Grace Presbyetrian Church in Peoria. We're talking with Music Director George Stelluto about some of the works on the program, including a Mozart symphony and a Viola Concerto by Gösta Nystroem, a Swedish composer who lived and studied in Paris. This week, we're talking with Chip Joyce. He's directing "The Graduate," which opens tonight at the Corn Stock Winter Playhouse. He talks about directing his first non-musical, why he likes this particular script, and why he thinks the story will resonate with multiple generations.